I thought that it would be fun to join Patrice at Everyday Ruralty for Chats on the Farmhouse Porch. We love coddled eggs best! :D We had them this morning. I love having my MacKenzie-Childs mugs around. I'm a habitual tea drinker! I blog with tea close at hand @ my built-in kitchen desk. 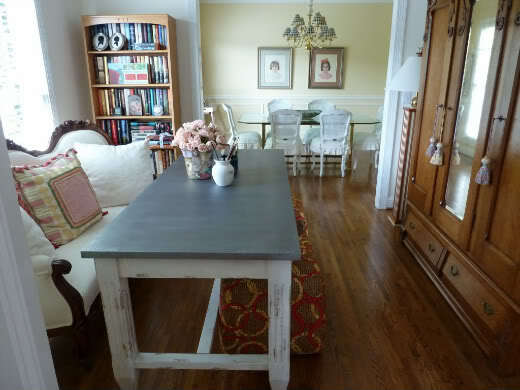 Our art studio has a painted and distressed table, dark wood antiques, and a contemporary blond wood bookcase. White distressed dining chairs are in the dining room. 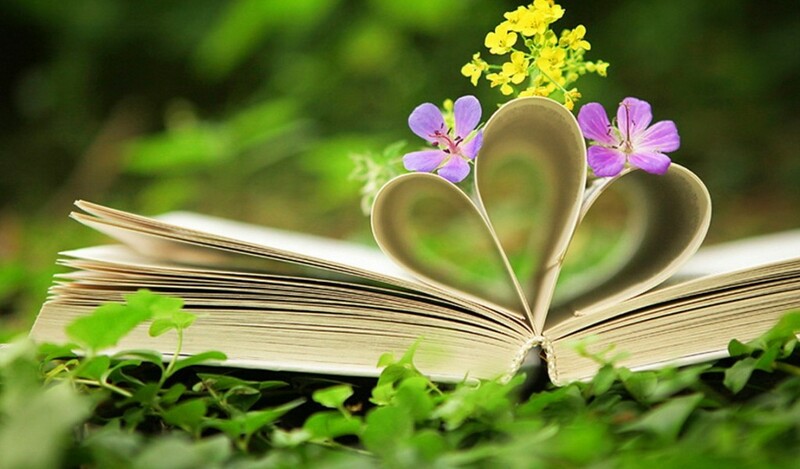 Books and flowers. Seriously, I read a lot, and I love to arrange flowers in our home. 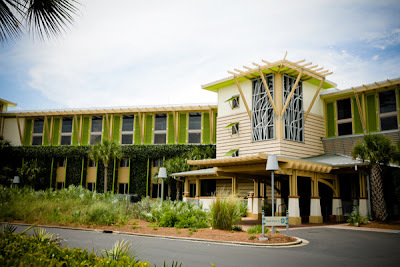 I would go to the Watercolor Inn near Seaside, Florida. 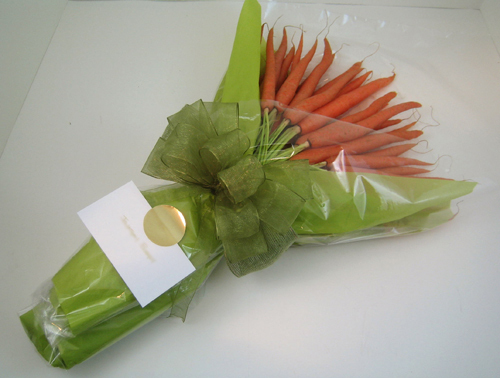 And here's a little something for Wendell...a carrot bouquet from Healthy Gourmet Gifts. What are you chatting about today? I could write a book about inspiring,creative bloggers like you for instance,I enjoyed reading this,and when you get readu to take off to Florida I'll join ya. I had to look up a coddled egg. Thank you for teaching me something today! I just love your blog header. It is very pretty. Okay first, love the new header. Second I love this series. Your house is so pretty and light filled. I bet Wendell is going to love your gift. They are the most thoughtful carrots I have ever seen. I just absolutely love your tea cup. I adore tea cups and am always buying pretty ones at the thrift store. I really like your blue china shelf. Very nice! Hi RJ! Don't shoot me as I've never had a coddled egg and really don't know what it is. You've been fiddling with your blog's dress and it looks wonderful! Although I couldn't find your pretty little face! :) I'm also in love with that blue shelf! I'd love a cabin in the woods getaway. Especially with a fireplace and a cool evening! I love eggs! Yum. A weekend in FL sounds great. It's supposed to be 14 degrees here tonight! Such a beautiful post..enchanting images..gorgeous! and lovely thoughts to ponder! Ricki, You have great answers. I think the egg cups are very pretty. I'm into blue and white dishes. I am also a habitual tea drinker. The beach at the Watercolor Inn looks so inviting. Now-please! Wendell is so happy with his carrot bouquet. Thanks for joining in! The idea of a cabin in the woods sounds right to me...except I'm afraid of bears! Your home is very much like mine with a mismatch of furnishings. If I like it, it stays! That was fun! I always enjoy learning more about you. That is a beautiful mug. I enjoy a cup of tea after supper but have yet to find the perfect mug. I love the egg cups too. My grandfather always used one. I wish I still had it. Hi Ricki Jill, thanks for visiting my blog and leaving a comment. I've heard of coddled eggs but had never seen a coddled cup. It's quite beautiful. I love learning something new so I read up about them and now I know more about them. I love your answers and the creative way that you have visual aid to expand on your answers. I don't think I have ever had a coddled egg either Ricki:) Beautiful mug and egg cup too! Nice finding out more about you! I have never had coddled eggs I will have to give them a try. I love the carrots! I always enjoy learning more about blogging friends, enjoyed this! Also, love your blue plate rack, so pretty! Beautiful bouquet for Wendell! And now I have to go research coddled eggs, never heard of that one! I need to try those coddled eggs some time. And I have noticed that lots of people have quite a mixture of furniture in their homes. It's really quite popular to do so. Hope you are having a great week! That carrot bouquet has to be the cutest thing I've seen lately. I'm pinning it. Just saw my picture here of the carrot bouquet I created for one of my fantastic and very creative customers. How wonderful and thank you for showing it. Isn't it fun!